Narrative and argumentative paragraphs have different goals. Arguments and narratives are two genres of essays you may be expected to compose in a writing class. An argumentative essay addresses a specific position on an issue with the intention of persuading readers. 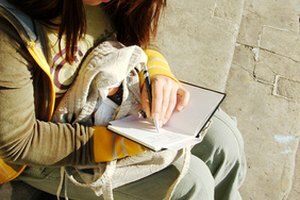 A narrative essay's goal is to tell readers a story, often about an experience that resulted in a powerful life change. Because of these differences, examples of their paragraphs will look very different. Argumentative and narrative essay paragraphs differ according to elements such as structure, length and use of language. In an argumentative essay, each paragraph details one reason for the author's position. The first sentence introduces the reason, while the rest establishes its validity with supporting evidence. This can include statistics, facts or documented anecdotes. An argumentative paragraph also tends to have a clear conclusion, in which the author summarizes the importance of its ideas. By contrast, a narrative paragraph moves the action of the story forward instead of functioning as a single unit. Rather than ending with its conclusion, the details and events it sets up will continue to be developed in the succeeding paragraphs. Argumentative essays are rarely written in first person. Each paragraph generally will be developed in third person to allow for objectivity and adherence to a conventional academic voice. Stating an argumentative point in first person can give readers the impression of bias or a need to rely on personal opinion due to lack of knowledge. Narrative essays, though, often require a first person voice because of the personal nature of the story. A strong first person voice allows readers to identify with the author's experiences and sympathize with him as the events progress. Tone is the way language reflects the attitude of the speaker. Depending on the genre, it can be positive, negative or neutral. The tone of argumentative paragraphs is usually neutral. While the author may feel strongly about her position, the best way to persuade readers is through fair, objective treatment of the issue. In a narrative essay, the tone of each paragraph will reflect the events of what is going on at that point in the story. If the section is dealing with death or illness, the tone will be somber, while descriptions of happy memories will be more joyful. Because each paragraph represents a point in the author's argument, argumentative paragraphs will all be about the same length, though some may be longer due to the use of direct quotations. A narrative essay's paragraph length, however, can vary from one line that emphasizes a single detail to a paragraph of description and action. Dialogue usage complicates the narrative definition of a paragraph as well. Since the story may include dialogue exchanges, where a new paragraph begins when a new person speaks, one page may even include multiple very short paragraphs. Morgan, Kori. "The Difference Between Argumentative & Narrative Paragraphs." Synonym, https://classroom.synonym.com/difference-between-argumentative-narrative-paragraphs-1901.html. Accessed 23 April 2019.